RevGlue offers four core modules for publishers on revenue share model. There is no cost to use these modules for publishers and these modules offer full stack of data and built-in CMS with the RevGlue technology. None of these publisher modules require affiliate network accounts or any designer or developer to help you with website development. Publishers can earn 80% share on each commission generated from user sales with all the publisher modules. RevSocial - Allows you to share coupons, daily deals, banners, mobile comparison, product feeds or even simple store links on your social channels such as Facebook or Twitter. RevAds – Create unique dynamic ads with RevGlue data sets, customise them with unique colours, fonts, layout and publish them on your website with a single line of code. 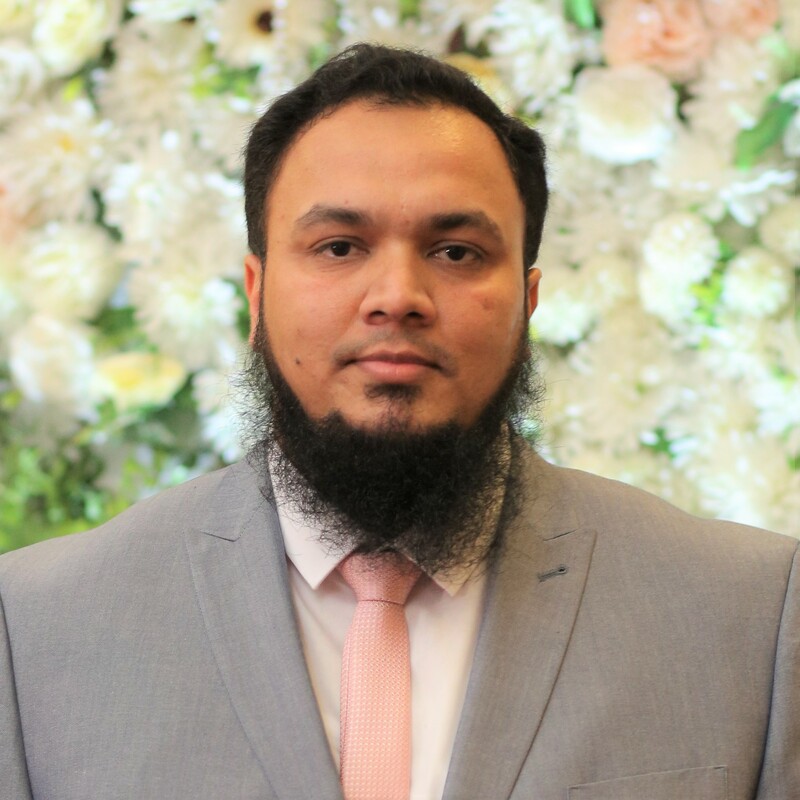 RevLinks – If you are blogger or running a content website but not sure how to monetise your website contents then RevLinks is your solution that will convert all your website links and keywords into paid links. This module allows you to create your UK discount coupons website in ten minutes. We are working on other website segments such as mobile comparison, broadband comparison and more and you will see them coming live in the next weeks within the RevEmbed technology. Step 1 - Create a free user account. Click on Sign up link from RevGlue.com and provide your email and select a password for you to login to your account. If you already have a RevGlue user account then skip to step 3 below. 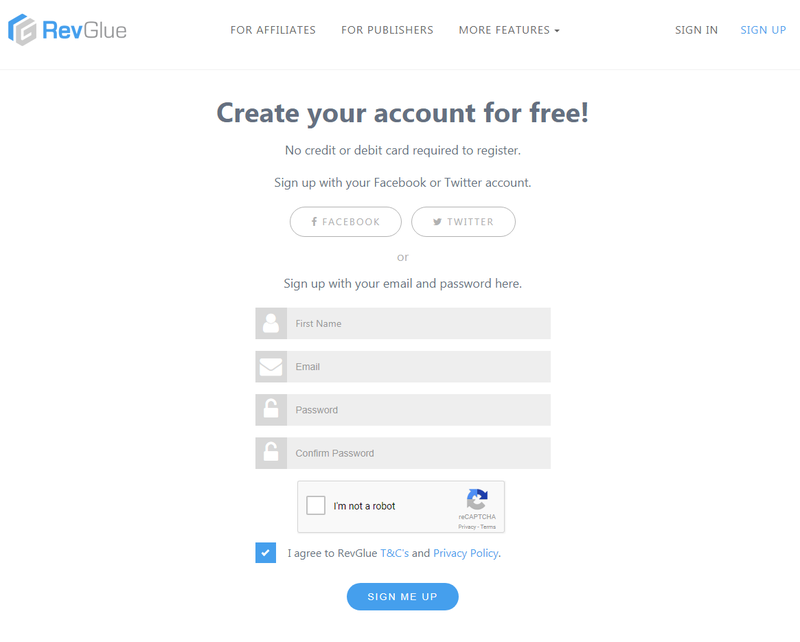 Step 2 – You will receive an email from RevGlue to validate your email address. 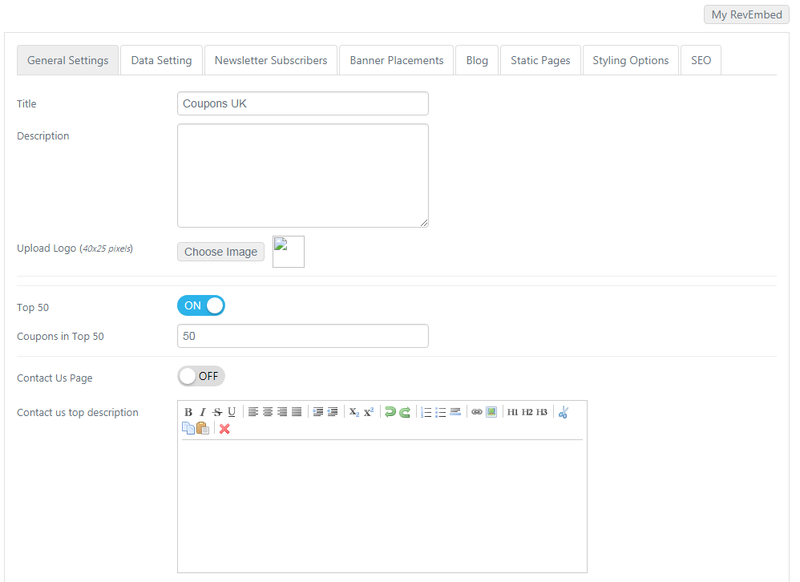 Click on the validation link provided in the email and you are ready to browse RevGlue dashboard panel. Step 3 – Click on RevEmbed menu from the left side and then projects menu under it. On the right side you will be able to view ADD NEW PROJECT button. 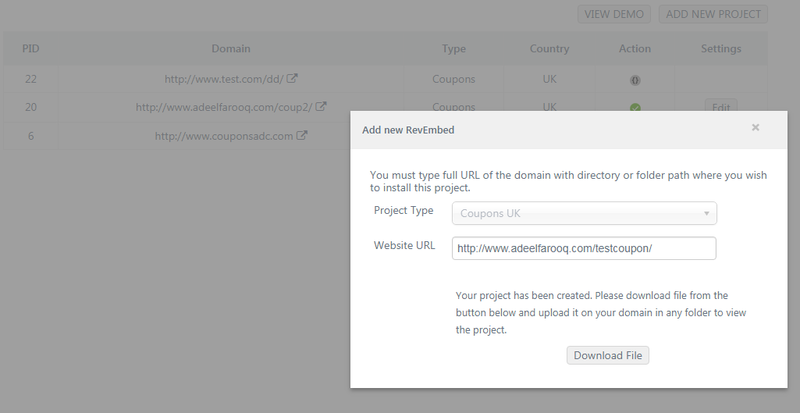 Step 4 – Click on ADD NEW PROJECT button and a popup will appear requesting you to provide the path of the domain where you wish to setup the RevEmbed coupons project. It could be your main domain such as www.mysite.com a subdomain such as coupons.mysite.com or a folder within your domain such as www.mysite.com/coupons/ You can decide where you want the coupons website to appear. Click on Add RevEmbed button and you will be presented with another popup. Step 5 – As shown in the image below. You are provided with a Download file button now. Click on that button to download the RevEmbed index.php file. Download that file for domain validation on your local computer. Step 6 – Once you click on Download file button, an index.php file will be downloading that takes about 1-5 seconds. The popup screen will change to help you understand what to do with that file in the next step. Don’t close this window and open your FTP software that you use to upload files on your server. Step 7 – You can see in the image below that I have opened my filezilla FTP software and connected it to my domain. 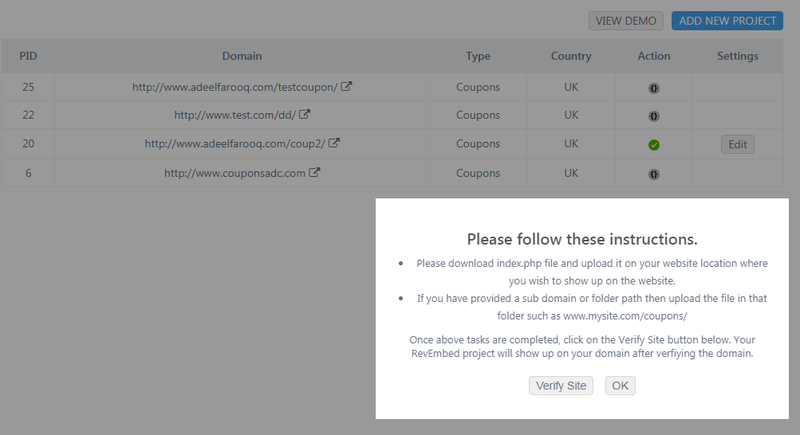 I have then created a subfolder in the root folder as testcoupons and then copied the index.php file across to that folder from my computer. Make sure the file is uploaded in the right folder for validation. Step 8 - Click on Verify Site button in the other window and RevEmbed module will verify your domain instantly. You can always view the Action column below if your website has been verified. Please don’t remove the index.php file from your server. 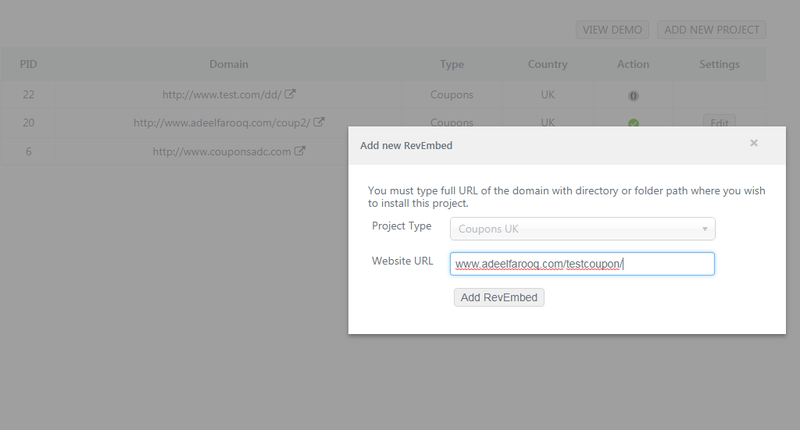 Step 9 – You can click on the link icon or type your domain in the browser to view the Coupons website. I can see mine as shown below. 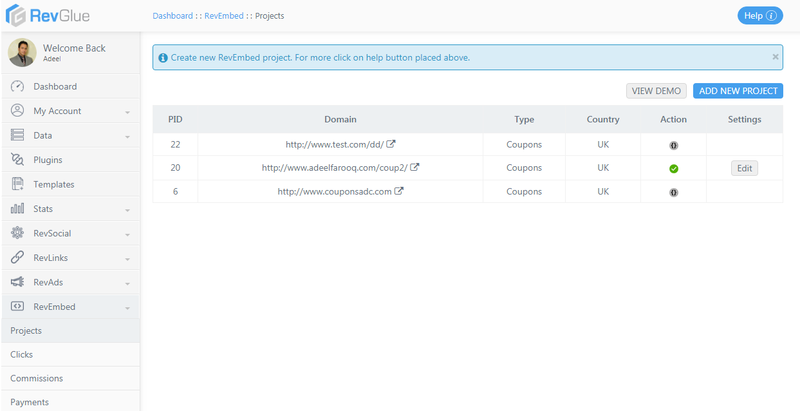 If you have mod_rewrite enabled on your server then your RevEmbed coupons website will show pretty URLs. My server guys have disabled it so I will see .php file names. Therefore, make sure you ask your server hosting engineers to enable mod_rewrite module on your hosting package. Step 10 – Now your website is live but you can still make so many changes to your coupons project. Click on the Edit button on RevEmbed panel in front of your verified domain and update the information as you like in there. General Settings - update basic information, title, logo, description and contact us information. Data Settings – Update data capture fields you wish to allow on your coupons website. Newsletter Subscribers – Download list of your latest newsletter subscribers on the website. Please note that your users’ data is not shared with anyone. Each RevEmbed project has its own settings and user base. All the changes you make in this section will only reflect on your project. Banner Placements – You can update home page main banners after the header from here. Design promotional banners and update them frequently. Blog – Write blog posts with offers, coupons and other useful information for your project. Styling Options – You have two core options here. First option is to change the colour scheme of the entire project. Second option is to edit website heading in easy editing mode. SEO – Update seo tags for each page here. Some of the pages are dynamic that we suggest not altering them. However, we suggest updating static pages SEO tags. 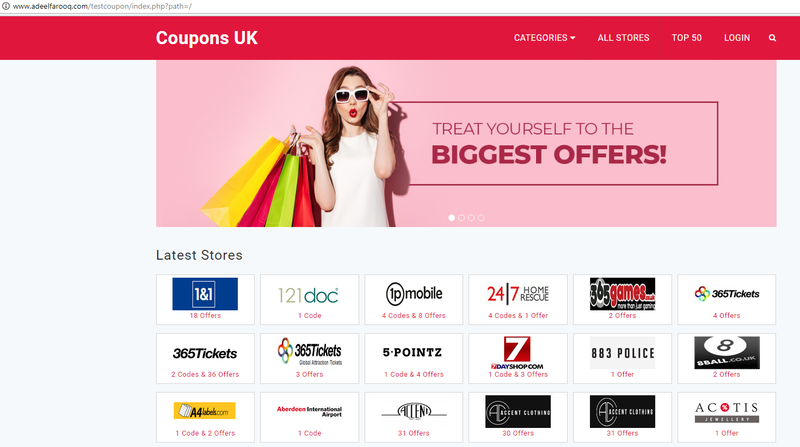 We at RevGlue aggregate coupon codes and discount offers from all the UK leading affiliate networks for you that are instantly showing on your RevEmbed coupons project. You can then promote the project to your users or start promotional campaigns to bring fresh users who are looking for coupon codes from top UK stores. The users will then click on stores or coupon links and they will be redirected to ecommerce stores to make the purchase. In the RemEmbed menu you can also view three more sub menus after the project. Here is quick summary on each of them. Clicks – You can view exit clicks of your RevEmbed projects here that shows when user made an exit click and on which store or coupon. Also checking if the sale was successful and the affiliate networks have issued the commission on it. Commissions – Here you can view all those clicks that have been converted into commission for the successful sales. When a user makes a sale, the commission’s data is provided to the affiliate network. We then at RevGlue fetch this data from the affiliate networks several times a day and that is updated here for you. You can then request a cashout as soon as you have £100 in payable commissions. Payments – Here you can view all your payments requested from RevEmbed. RevGlue can make the payment in your paypal or in your bank account. 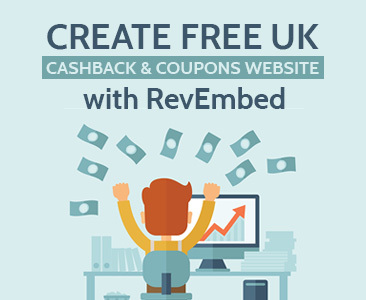 Create Free UK Cashback & Coupons Website with RevEmbed. 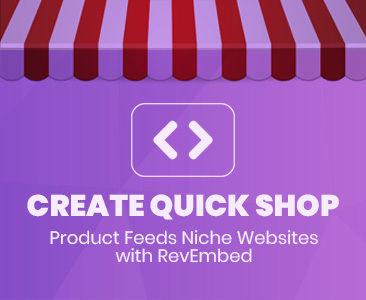 Create Quick Shop UK - products feeds niche websites with RevEmbed. 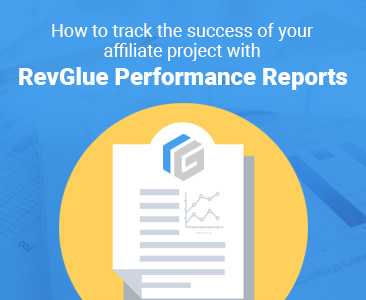 How to track the success of your affiliate project with RevGlue performance reports. Create Free user account and start monetising today.